A very stylized, funny black comedy that delves into the film noir genre and finds all the right humorous qualities about it. The Coen Brothers have always been artistic and they’ve also always had an edge for doing film noir. Both of those qualities are never as evident as they are in their film The Man Who Wasn’t There. Since the beginning of their career as filmmakers with Blood Simple, film noir has been their genre of choice. Sometimes it’s more in the vein of comedy (The Big Lebowski, Raising Arrizona), other times its going straight for the jugular with dark black comedy (Fargo), and sometimes its not meant to be comedy at all, but just a dark and dirty crime movie (No Country For Old Men, Miller’s Crossing). With The Man Who Wasn’t There, there’s no hiding what they’re going for, a straight forward black and white film noir reminiscent of the forties and fifties films that kick-started the genre. The movie is about a barber who finds out his wife is having an affair and decides to blackmail the man she’s having it with. One thing leads to another, and soon we have a murder on our hands. The movie deals with trials and lawyers, but also with crime and deception. Billy Bob Thornton plays the barber as a cool, calm individual who describes himself as a ghost, and it’s not hard to see why. The movie is slow moving and it’s certainly not for everyone. But it’s artistic and peaceful and quite funny. You have to like the Coen Brothers to like this movie and appreciate the way characters talk in their films. Only Tarantino’s characters have more rhythm than the ones who populate the movies by these Brothers, and even that is debatable. John Goodman is often their go to guy, but he’s absent from this film and impressively enough, not really missed. Filling his shoes is James Gandolfini and he more than holds his weight. Frances McDermond, another Coen regular is on hand, funny as ever, and so are a bunch of actors who have appeared occasionally in other Coen Brothers pictures. Jon Polito who plays Creighton Tolliver and also the great Tony Shaloub, both of whom were in Barton Fink. Michael Badalucco who appeared briefly in Oh Brother Where Art Thou. They mesh nicely here with guys like Gandolfini and Richard Jenkins. If there’s one thing all of these actors have in common, it’s the way they talk. A cool, quick, specific rhythm. Not one of them talks slow. Leave that to Billy Bob Thornton. And this is one of the running jokes of the movie. That Thornton’s character, Ed Crane, is a slow talking, slow moving kind of guy in a world where everyone around him just won’t shut up. Shaloub plays lawyer Freddy Reidenshneider as a fast-talking ego maniac who walks all over Crane without batting an eye and is absolutely hilarious in every step he takes to do it. Badalucco, who works the barber chair beside Crane, never stops babbling about his many theories on things. When he leaves the barber shop and Crane hires a replacement, he looks for the quietest guy he can find. And that guy turns out to really be the biggest talker of all. For femme fatales, we are given two. There is of course McDermond, who isn’t the least bit honest or emotional with her husband at any point in the film. She seems to constantly have her own agenda and be perfectly ok with that. And she’s tough as hell. Just watch the scene where she shoots down a door to door salesman in the blink of an eye. And then there’s Scarlet Johansen as the young girl, prodigy, with her smoker-like, deep, dark voice. She’s the innocent one in the picture and maybe that’s why Crane takes an interest in her. She’s quiet and simple-minded and seems to be the only one in this world who Crane can actually tolerate. 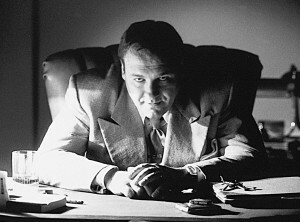 His character narrates the whole movie, going the route of a classic film noir, with main character voice-over work. It’s especially good for this film, because it makes up for the fact that Crane almost never talks. The character is more like an observer looking around at the crazy world outside his window. The voice over narration helps us see things through the character’s eyes. The movie has a certain poetry to it. There are multiple shots of Crane driving around, looking out his window at the people passing by, and just commenting on what he sees and thinks about what’s happening out there in the world. The black and white is extremely artistic and the Coen Brothers really work the shadows and silhouettes. Credit should also be given to their director of photography Roger Deakins who has probably never worked harder to accomplish a specific vision, than he had to do for this film. 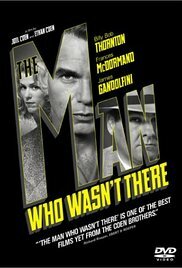 The Man Who Wasn’t There is an artistic masterpiece. Too slow moving for some, to be sure, but it does boil down to a tight story and twisty little mystery. And there’s loads of comedy packed in. The casting choices are magnificent, even in the smaller roles, and that really goes a long way to maintaining the exact rhythm the Coens are after. This is the ultimate film noir, made to look and feel like an older movie and it in every way accomplishes its goal.